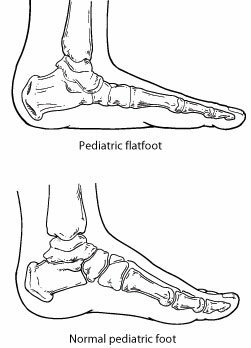 What Is Pediatric Flatfoot? Flatfoot is common in both children and adults. When this deformity occurs in children, it is referred to as “pediatric flatfoot.” Although there are various forms of flatfoot, they all share one characteristic – partial or total collapse of the arch. 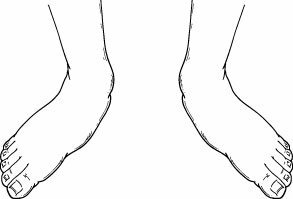 Diagnosis In diagnosing flatfoot, the foot and ankle surgeon examines the foot and observes how it looks when the child stands and sits. The surgeon also observes how the child walks and evaluates the range of motion of the foot. Because flatfoot is sometimes related to problems in the leg, the surgeon may also examine the knee and hip. Non-surgical Treatment If a child has no symptoms, treatment is often not required. Instead, the condition will be observed and re-evaluated periodically by the foot and ankle surgeon. When Is Surgery Needed? In some cases, surgery is necessary to relieve the symptoms and improve foot function. The surgical procedure or combination of procedures selected for your child will depend on his or her type of flatfoot and degree of deformity.